1) Invest in a good quality camera. 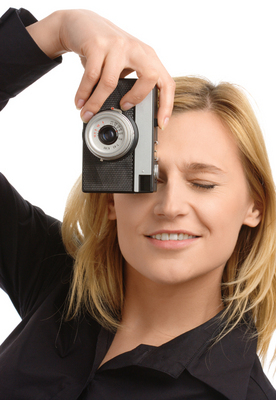 If you are serious about selling your products online, you should be able to invest in a proper camera. There’s no need to buy an overly expensive, top-of-the-line model, but at least spend your money on a decent digital camera with settings and features that can help you take the best possible photos. 2) Learn how to use your camera. You may have a great camera, but do you know how to use it? Although the camera’s auto setting may be great, it may not always be the best option. Learn how to use these settings! 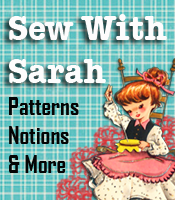 Experiment, take a class or workshop, or read online tutorials. Proper lighting is an important element in a good photograph. When possible, grab your equipment and products and head outside to shoot your product photos. Take note that direct sunlight may not be the best choice, as it will increase the harsh lines and shadow effects on your product. Indirect light, on the other hand, will definitely give you great shots. White is the most popular background color when it comes to product photos, and with good reason. You want your customers to focus on the product, and not what’s surrounding it. If a white background isn’t available, then use any other solid color. Avoid shooting directly down on your product. Instead, take a variety of pictures in all kinds of angles. Shooting your products from various points of view will make them look more appealing and interesting. Be careful to avoid angles that may cause the product to appear distorted due to perspective, however, such as clothing shot at strange angles. Many websites allow users to post several shots per listing. Take advantage of these slots by posting at least one full-sized photo of your item and a number of close-up shots, as well. 6)Don’t be afraid to use props. Many times, sellers opt to use props in their product photos. Be creative! Props, when used properly, can add a professional touch. Of course, be sure that your choice of props are not overwhelming and steal the scene completely. 1) Always greet your customers. Always make it a point to make your customers feel welcome by greeting them. When possible, do so by name. Everyone loves to feel recognized and remembered. 2) Create a warm environment. Whether you’re selling online, at a craft fair, or in an actual store, always create an environment that is warm and inviting. Make your space comfortable, encourage browsing, and let your customers know you’re there if they need anything. When it comes to customer service, you should always remember to communicate with your customers often, and to communicate with them quickly. Don’t allow your customers to go days without hearing back from you or they will feel neglected and unimportant. Respond as quickly as you can, and regularly keep them up to date on your transaction. Did you give someone the wrong amount of change? Did you ship the wrong item? Admit your mistake and apologize sincerely. Don’t stop there! Make it up to the customer, too. Give him or her store credit or a small freebie to make up for any inconvenience you may have caused. Don’t let customer loyalty go unnoticed. Offer free shipping or throw in a customer discount for your repeat customers. All business owners should recognize that customer loyalty is worth a whole lot more than a single sale! 6) Go the extra mile. Pay close attention to what the customer wants. If a customer wants a necklace to be shorter, make it shorter. If a customer wants an item to be a different shade of blue, create one in the desired shade of blue. Go the extra mile and your customers will definitely appreciate it. 7) Let your customers know you value them. You’ve already done so well—don’t stop now. Send your customers a short note thanking them for their business, and maybe include a discount voucher for their next purchase. Send them handwritten cards on their birthdays or during the holidays, or even just a quick personalized confirmation email for online registration or orders. Whether you work for a business or own a business, it is important that you pay close attention to the quality of customer service that you provide. Follow the seven tips mentioned above and you’ll definitely be providing your customers with an experience that they’ll never forget. Don’t use up all your creative juices on creating your products. Save some of that imagination and inspiration for your booth display. You want to do your best to draw attention and stand out—especially if you’re selling something that may have a lot of competition at the craft fair. You don’t have to be a business school graduate to know that marketing is key in any business. How will someone find you later on if they don’t know your business name or where they can reach you? Business cards, flyers and even catalogs are great ways to get people to remember you. Make sure that all of your products are clearly labeled with your store name and your contact information. This way, you can be sure that both the buyer and/or the recipient will be able to find you again later on to purchase more of your product. Punch a hole in your tag, tie it to your product with a ribbon and you’re ready to go. Bring along a box of supplies you may need in case of emergencies like string, scissors or glue. It’s always best to be prepared for the worst. The craft tools, extension cords and other supplies you bring may just come in handy. 5) Interact with your customers. No matter how shy you may be, do your best to interact with your customers. Shoppers at craft fairs love to meet the artists, so put on that smile and make contact with everyone who comes to your booth. 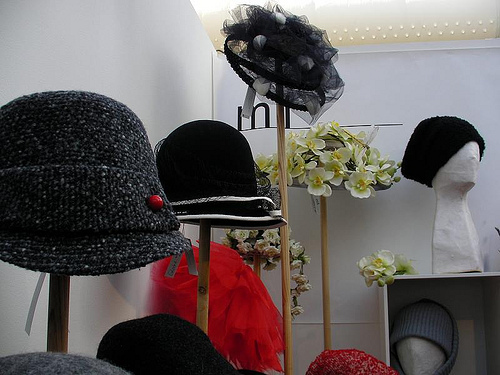 Craft fairs are a great way to meet people with the same passion for all things creative. Collect business cards from both fair participants and attendees and if time permits, send out a friendly email to your newfound friends a few days after the fair. You’ll probably see them again in future shows! A great way to create a customer database is by setting up an attractive guest book at your booth and invite shoppers to leave their names, contact information and comments on your work. You can email your customers to thank them for dropping by your booth, or send them a message to let them know when your next show is. You can also opt to attach a discount coupon to your newsletter so you can track how effective your promotion method was. Check out Curbside Chaos and watch the video of Ruth and her family from Fairfax, Virginia, winners of the $5,000 Yard Makeover, getting a new backyard. They brought in experts to design a backyard escape and used lots of bulbs like gladiolas and lilies to add splashes of color. If I had won the yard makeover I would also love to create a backyard escape with lots of hidden seating areas and meandering paths. 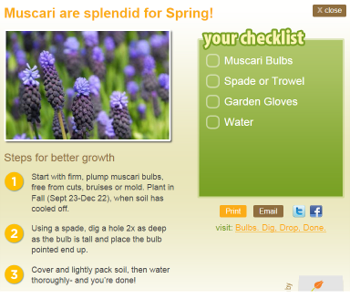 I also really like the idea of planting an assortment of bulbs and the Garden Guru section of the site (bottom left on the front page) helps you to pick the best bulbs for your area and gives you information on when and how to plant them. 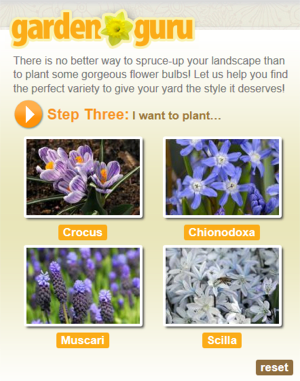 These purple and white varieties – Crocus, Chionodoxa, Muscari and Scilla bulbs – are perfect for the color scheme and style that I have in mind for my back yard plans. 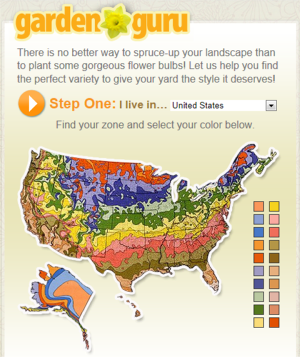 The great thing is that in addition to planting recommendations based on your area, you also get free detailed planting instructions and tips to help you grow gorgeous flowers that bloom in the month that you want. Plus you can "Meet The Ladies' and learn from their tips – I really enjoyed hearing about Evelyn's tips on which bulbs to plant to help keep pesky animals from destroying the yard because I need those! Even if you don't have a yard to makeover, you can use bulbs in pots to decorate a porch or kitchen window. You can also make great gifts from bulbs from the holidays and you'll find lots of inspiration in the many videos available when you visit www.digdropdone.com to learn more. While you're there, share the information on Twitter with the hashtag #CurbsideChaos and "Bulbs. Dig, Drop, Done" will donate $1 to Rebuilding Together – a nonprofit organization that works to preserve affordable homeownership and revitalize communities.